New to group. My latest project..
Thread: New to group. My latest project..
Howdy all! I am new to the group. I want to be a quilter so I have been watching lots of YouTube videos and even signed up for some Craftsy classes. I feel like I sew a bit and watch a video... Sew. Watch video. :-) My grandson will be a year next month and I decided to make him a dinosaur quilt. I bought a panel with cute fabric and thought it would be my background. Wrong! When I got the top pieced I decided it was on the small side so I cut into the panel... It's the border on this quilt. I guess my Plan B is to do denim on the back... My plan is to machine quilt it. Any suggestions for pinning the top, batting and back together to prevent wrinkles? nicely done and welcome to the QB. start by laying out the backing and tape it or clamp it to the surface or table. then lay the batting and smooth it out. i tape this, too. then lay the top. again, i tape this. then pin all over about a hand's worth apart. there will be many other ways explained soon, i'm sure. This is the way I do it. Make sure the backing is face down...ask me how I know that!! Nice quilt, your grandson will love it, and welcome to the group. Welcome to the group! There are many ways to prepare for quilting. Everyone has their favorite. There are also video on YouTube. You can go there and see what will work best for you. Some stitch, spray and pin baste. You will be consumed by this board. This is like an encyclopedia of quilting. Your GS will love it. It's really cute. Very nice quilt. I'm sure GS will love it. Welcome to the group. This is how I got started - making a quilt for my first grandson. 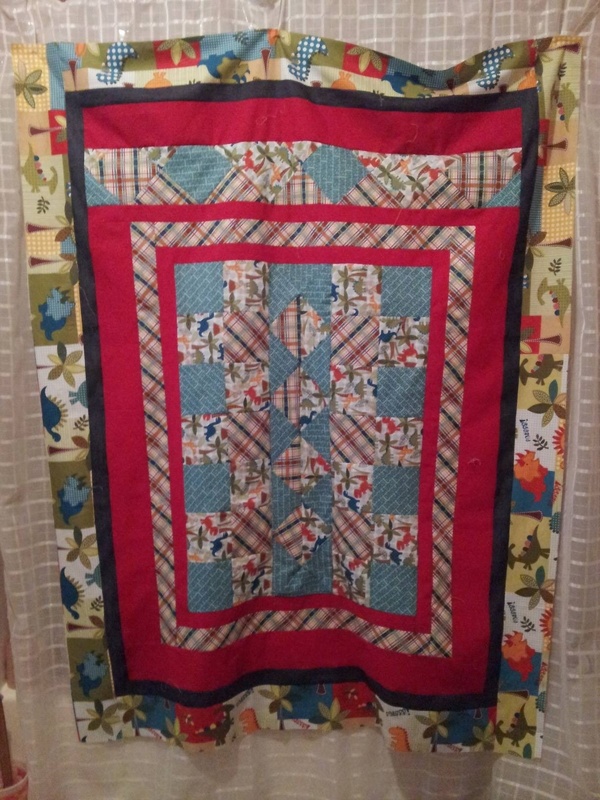 I have grown in my passion for quilting and find in retirement it is what gives me an opportunity to be creative and a way to show someone I care as most of my quilts are gifts. I use Elmers Glue to sandwich the layers, be sure it is the washable kind. There are some good how-to tuts on this site. I used to hand baste the layers but found the glue method cut my time by at least half and the results were as good or better. Welcome to the Board. Love your guilt, the greatest thing new quilters bring is their fresh perspective. Love the creativity in your quilt! Had to laugh about your change in plans, seems to me quilts take on a life of there own and start bossing you around. Look up "Elmer's School glue" in the box with the magnifing glass on the top right of each page. There has been a huge movement toward using the glue because it allows mistakes to be corrected easily (a damp cloth will disolve the glue if you get a wrinkle and you can redo the area so it is perfect). It is non-toxic, inexpensive, easy to lay down a THIN dribble (but not a tragedy if a blob happens), sews easily (must be washed after the quilt is done to disolve the glue), AND it is the easiest way to sandwich a quilt. Some of us also put the batting into the dryer to soften it before using because it takes out any wrinkles or stiffness and makes it easier to work. Try it, you'll like it! That's such a cute little boy's quilt! Nicely done! Welcome to the board. That is a very cute quilt for your DGS. I also like the Elmer's school glue it is so much easier than hand basting or having to remove pins as you quilt. Welcome to the board!!! I also use Elmers School glue to baste! LOVE IT!!! No more pins for me!!! When I used to pin my sandwich, I fastened my backing down to my table using bull dog clamps on the table edge or on the floor with masking tape. If you slip a marble under the backing, this will give you a little space to get the pin under the backing and back up through the layers. The marble can be rolled along as needed to the next pin spot. Make sure your backing is about 2 inches bigger all around the size of the top. Lay your batting on top of the backing (cut the same size as backing) and smooth the top over the batting. You are now ready to put pins in about every 4 inches apart. Start quilting from the middle of the sandwich outwards so that any wrinkles can be moved to the edges. Check the instructions on the batt package for how far apart the quilting lines can be. Good luck. Welcome! For years I crawled around on my hardwood floor pinning the three layers together and then crawled around some more to hand baste the entire thing. It was the part of the process that I dreaded. Then I discovered spray-basting and my world changed. Lay the backing face down on your flat surface then lay the batting on top. I lift up the batting diagonally from the edges and spray underneath it to the center. Pat it down. Next lay your quilt top on the batting face up. Again, lift up the corners diagonally and spray underneath from the center to the edges. I still use my hardwood floor - if I overspray I let it dry, then take a cloth with orange spray cleaner and it wipes right up. Then I bring the entire sandwich to the machine and start quilting. Haven't had a single pucker since I discovered the spray. You may find the denim too heavy to quilt. Why not try some flannel? If you don't wash it first, it won't be as hard to use, and after it's washed it will shrink up nicely like an old fashioned quilt. This is adorable! That is a great way to use plaids and prints together. Welcome to the Board. That quilt is going to be loved tremendously! Others have given good advice to your question, so I'll just say...enjoy! Welcome to the board....Nice quilt...I like to use spray glue to hold my small projects together. Welcome to this board. The quilters on here are wonderful and a marvelous source of information. I use my ironing board, raised to its highest position and with a sheet of plywood over it, about 4 x 6, to spread my backing, and clamping it, then add the batting, clamp it, and finally, the top and clamp it. You should have a smooth top and you can stand up to baste it if you choose to pin baste it. (My knees won't let me get on the floor anymore.) Have fun! Your first quilt looks great, by the way. One more suggestion to you: Make a label for the quilt and quilt the label into the quilt. Also, start now keeping a log of your quilts--giving pertinent information and maybe even including snippets of fabric from said quilt. I wish I had done that years ago. Include a picture of the quilt as well. You will be glad you did. Welcome to the Quilting Board. I love the quilt you made for your grandson. I just sandwiched a quilt last night. I ironed the top and the backing before I started. I used a Hobbs Heirloom 80/20 batt. I like the Hobbs 80/20 batting best because I can position it easier than a 100% cotton batt for some reason and if there are any lumps in the batting they smooth out without a lot of trouble. I was able to get my quilt sandwiched and pin basted last night without a lot of cursing. This is what I do, too, only using my dining table instead of the floor.....since I can't get down on the floor. Well, I can get down, getting back up is the problem. I wish I liked Elmer's washable glue method better (I love it for joining seams instead of pinning) but the one time I used it I got lots of globs and it didn't adhere as well as the spray. Also, squeezing that bottle for such a long time made my hand cramp up. Probably I needed to thin it a little, and next time I'll try that. You're getting excellent advice here from all these other experienced piecers/quilters. I'm in the process of quilting all the tops I've made and as I do so, I realize I was not as careful, as precise, or as particular when making those earlier tops as I have been since I began reading this board. I'm self taught and there is at least a lesson a day available in the messages on this board. It's a good thing! as Martha would say. Learning something new everyday from all of you. I agree about the denim and the flannel. Or you could try Minkee. It's wonderful as a quilt backing. and you really don't need batting.